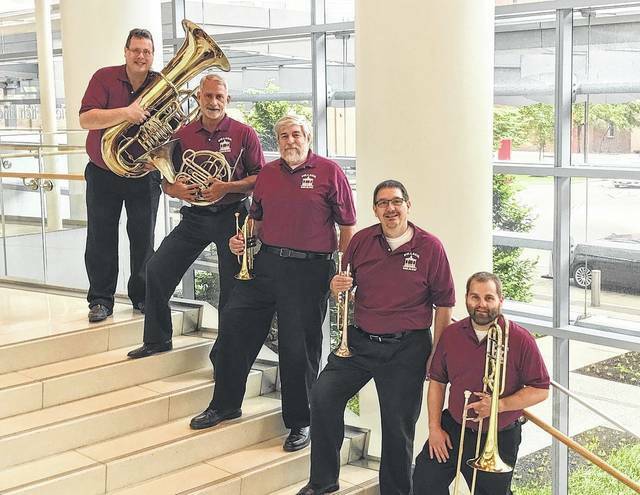 The Central Ohio Symphony Brass Quintet is comprised of Bob Munson, tuba; Todd Swatsler, french horn; Dale Nawrocki and John Bierley, trumpets; and Tony Weikel, trombone. They will perform at 7:30 p.m. Saturday at McNamara Park in Genoa Township. As part of its Summer Music Festival, the Central Ohio Symphony will perform in McNamara Park in Genoa Township on Saturday. The concert will start at 7:30 p.m., one hour before the McNamara Park Movie Night showing of Disney’s “Moana.” McNamara Park is located at 7049 Big Walnut Road, Galena. The Symphony Brass Quintet, led by trumpets Dale Nawrocki and John Bierley, Todd Swatsler, french horn, Tony Weikel, trombone and Bob Munson, tuba, will perform on the park’s outdoor lawn near the shelter house that evening. The quintet will be performing an upbeat combination of medleys, marches, ragtime, and solos highlighting the different instruments. They will also play tunes from the Civil War, the Roaring 20s, and great composers like Stephen Foster and John Philip Sousa. Symphony Executive Director Warren W. Hyer said the group is excited about performing in Genoa Township. “We want to be able to reach more people in the communities where they are,” he said. “We have looked for a long time for a chance to perform in in the Township. This concert is part of a series of summer concerts by members of the Central Ohio Symphony based Delaware. This concert is funded by grants from the Delaware County Foundation, Delaware County Commissioners and the Ohio Arts Council. For more information about the summer concert series, call the symphony office at 740-362-1799. The symphony website, www.centralohiosymphony.org, will be updated with information, including maps and directions. https://www.delgazette.com/wp-content/uploads/sites/40/2017/07/web1_Central-Ohio-SymphonyVillage-Brass-1.jpegThe Central Ohio Symphony Brass Quintet is comprised of Bob Munson, tuba; Todd Swatsler, french horn; Dale Nawrocki and John Bierley, trumpets; and Tony Weikel, trombone. They will perform at 7:30 p.m. Saturday at McNamara Park in Genoa Township.